Green tomatoes. Vermillion, oblong spheres of tanginess. Waltzing through the farmers market you might see a small stack, lonely and misunderstood. Poor little gents don't get the credit they're due. You see, green tomatoes have long been paired with the term "fried." And while that is an appropriate term to associate them with, it's not like "fried" is the only word that should be paired along side of them. I fancy "zingy" or "tart" might become good friends with the green tomato. Or the word grilled may spark a heel-kick of delight. I'll admit, these little unripe fruits are a puzzle. They're too tart to eat raw, too firm. You can't stew them, add them to crisp green salads, or easily layer them on a giant sandwich. I imagine they'll be delicious roasted. But not for long, as the season for green tomatoes is quickly coming to a close. Which means that right now green tomatoes taste their absolute best: crisp and bright, meltingly savory when fried, grilled, or roasted. Green tomatoes are just tough enough that they hold up smashingly well to high heat. And so the searing begins. Fill a medium bowl with almond milk. Add vinegar, and let almond milk curdle into vegan "buttermilk." Fill a second medium bowl with corn meal, rice flour, and Old Bay seasoning. Mix to blend ingredients. Heat a cast iron pan to medium high heat, and add olive oil. Let the oil heat up until hot enough that some corn-meal mixture will bubble and spurt in the pan when added. 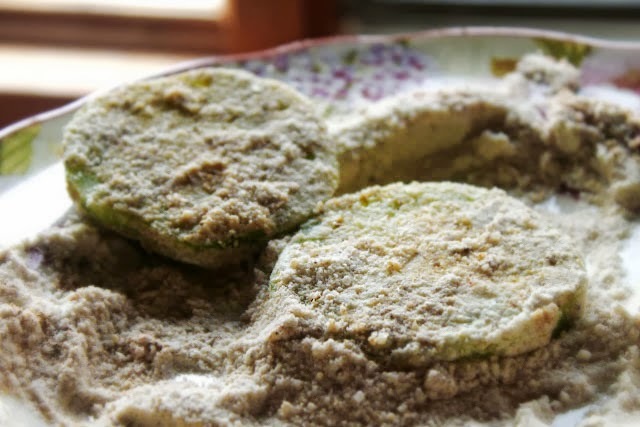 Dip your green tomato slices into the "buttermilk." Now dip the tomatoes in the flour mixture, coating both sides in flour. Place 4 or 5 slices in the hot oil for about 3 minutes, flipping and cooking for three minutes on the opposite side. Times for frying may vary depending on how hot your stove-top gets. When the tomatoes begin to brown, you know the side being cooked is done. Place cooked tomatoes on paper towels to drain. Continue in batches until the tomatoes are done. Toss green tomato slices in olive oil and Old Bay seasoning. Prepare your grill, heating it to medium heat. Place rounds on the grill, and let cook for about 5 minutes on each side, until grill marks are obvious. Mmmmmmm delicious. Especially good on a sweet-cool late Summer evening.